This week: We are watching some games strictly for the schadenfreude. Some of these things have no real merit beyond that. Also, we are going to strap you down and make you watch Michigan-Northwestern via A Clockwork Orange because your soul needs to be cleansed in the purity of Midwestern passive aggression. Broadcast from Houston begins at 8:00 PM tonight on ESPN2. Oklahoma is a favorite to win the Big 12 along with TCU and Baylor. They boast one of the top defenses in the country along with one of the most awesome, blustering linebackers. Their rivals in name and wealth across the state line, however, are in a state of dilapidation. Texas is such a mess that no one knows how to handle it. The fans are pissed, the boosters are even more ornery, and Mack Brown isn’t helping. A beat down by one of the best Oklahoma teams in recent memory might just send this thing into overdrive with all the speed of Bob Stoops’ Crimson and Cream Machine. Kickoff starts at 12:00 PM from the Cotton Bowl on ABC. The Tigers are off to a wonderful 4-0 start and are receiving a fair amount of press after their nationally televised three quarter beat down of a top ten ranked Notre Dame. The polls like them and the S&P+ ratings have them in the top five. If there was any moment that would set them up for a “Clemsoning”, a loss against 2-3 Georgia Tech at home would do it. Coverage starts from Death Valley at 3:30 on ABC. Tennessee is in the worst spot right now at 2-3 with a loss to what everyone thought was a pretty miserable Arkansas team. Now, Georgia, fresh off of their humbling by Alabama, comes to town to add another year of dominance over the Volunteers. The entertainment out of all this comes at the expense of which team who loses. Not going to predict any winners here buuuuuuut Tennessee plays like a vacuum salesman who just leaves a vacuum on the porch and says that you bought it. GAME 5: HOW DID SAILORS GET TO LANDLOCKED SOUTH BEND? They ran all the way using various formations which they will use to beat Notre Dame. Navy is 4-0 right now and is in a very good spot to hand a beaten Fighting Irish team its second loss of the season. If you’re really into Golden Domer schadenfreude, look this way! The game starts from South Bend at 3:30 PM on NBC. Here are some statistical ratings from Football Outsiders: Michigan currently has the 3rd best defense in the S&P+ ratings. Northwestern is currently the 6th best defense in those same ratings. 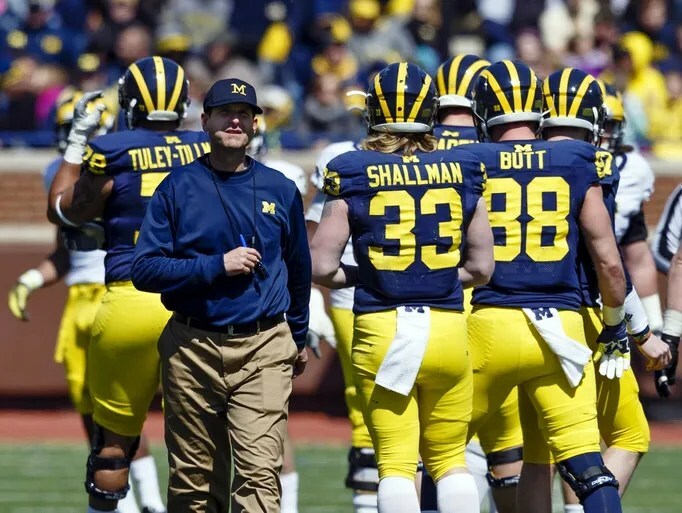 The Wolverines have the 53rd best offense according to those same ratings. The Wildcats have the 100th best offense. If you are looking for the most hair pulling, excruciating, futile display of offense this weekend. We found it right here for you in the battle of two Big Ten titans. Northwestern kicks off against Michigan at the Big House at 3:30 PM on the Big Ten Network. Oklahoma State has skirted by enough close games in Big 12 in ways that seem to border on illicit. West Virginia, despite a tough road loss against Oklahoma, is still a defensively sound team. Much more so than the hapless units of both Kansas State and that school in Austin, both of whom have played the Pokes. This has the potential to elevate the Mountaineers to maybe the fourth best team at the moment. Hell, it’s better than being Kansas. Game begins at 7:00 PM from Morgantown, WV on ESPN2. A lot has been made of Florida’s wonderfully competent match against Ole Miss. I am one of the people who feverishly thinks that the Gators could make a legitimate run at an SEC East title. In order for Florida to prove they can make this run, they have to travel to CoMo to play Gary Pinkel’s side show curiosity known as the Missouri Tigers. Mizzou does not have much in the way of offense which bodes well for the Gator defense. However, the Tigers are pretty competent on the defense which can test how good this Florida offense truly is. If Florida wins handily, the road to a division title runs through Jacksonville. Kickoff starts at 7:30 PM on the SEC Network. Al Golden’s seat is hotter than a stolen Lamborghini in Vice City after the Hurricanes’ road trip to Cincinnati. Now, they head to Tallahassee for one of the state’s biggest rivalry games. A game that includes the very fan base that tried to crowdfund all of those ‘FIRE AL GOLDEN BANNERS.’ The Seminoles are undefeated but most of their wins haven’t been resounding compared to 2013. Miami might have a chance with FSU RB Dalvin Cook being out; it’s not looking very good though. A Hurricane loss here would probably fire up Luther Campbell’s campaign to get Dana Holgorsen Hologram. Coverage is live from Tallahassee at 8 PM on ABC. College Gameday returns to Utah for the first time since the Utes joined the Pac-12. Their competition this weekend is the California Golden Bears, a favorite around this here blog. Utah has looked absolutely every bit the part of Pac-12 South favorite thus far but there are some who find fault in their secondary. If there’s anyone who is going to be able to throw against them, it’s Cal – a team that’s built to zip it down the field. If the Golden Bears come out of Salt Lake City with a win, they go bowling for the first time since Jeff Tedford’s tenure. A Utah win is just another step towards Pacific Coast dominance. Game starts at 10:30 PM on ESPN.